There’s no reason to be modest, you’re a really big deal. If you made your grand exit tomorrow, your family would be crushed. Which is probably why you’re looking into term life insurance, to minimize the financial burden on your family when you’re gone. But that’s expensive, right? Actually, term life is one of the least expensive options. And our independent insurance agents do things a little differently. They shop and compare policies from multiple companies to find the right coverage and the right price for you. How’s that for perfect? Now, term life insurance isn’t a set price for everyone like a jelly-of-the-month club—the cost depends on a number of factors. So let’s talk a bit about what term life insurance is and how insurers come up with their prices. What Is Term Life Insurance and Why Do I Need It? Term life insurance is just one of many forms of life insurance—each with their own pros and cons. In a nutshell, all life insurance policies are contracts between you and an insurance provider. You give them money and they give you a death benefit (a selected amount of money) when the time comes. The what: Term life insurance, specifically, is a policy that’s active for a specified term, say 15, 20 or 30 years—whatever you choose. The why: One of the greatest advantages of term life insurance is that it costs considerably less than whole life policies—but premiums do get more expensive each year you're alive. Plus, it’s non-taxable, which means your beneficiary (the person you pick to get your money) gets every penny. The insurer’s brightest math minds begin by evaluating a series of risk factors (i.e., age, gender, location, etc.) that have costs associated with them. The cost of these risk factors is determined either through studies of historical trends, or via analytical models (basically, a lot of super-sciency/mathy stuff). Next, they'll check off the attributes that apply to you, add a bit of extra for their profit margin and—ka-boom—you’ve got your premium. However, due to competition from other companies, they might even lower the price a bit—which is always nice. Your life insurance goals with regard to savings, etc. 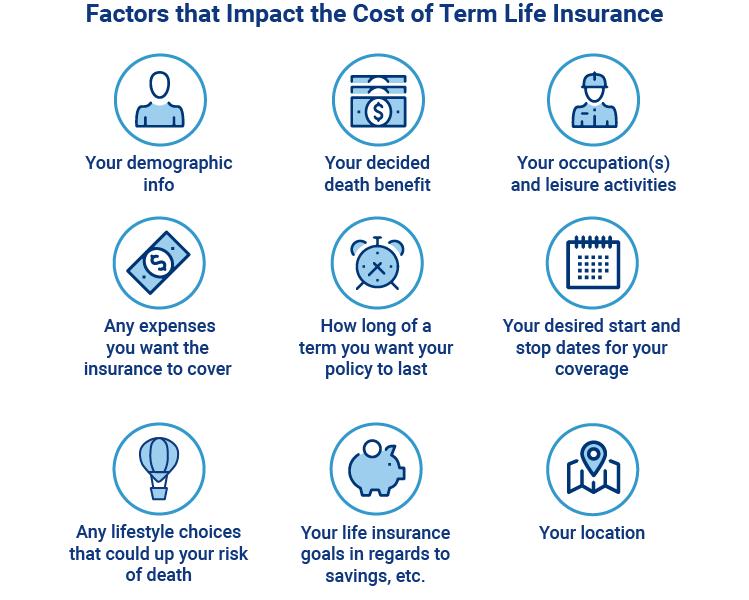 So, basically, the cost of your term life insurance policy is determined by the perceived risk of your death during the term you’ve chosen. Obviously, the younger, healthier, and more safety-conscious you are, the cheaper your coverage will be. However, for those at the other end of the spectrum, if you take steps toward becoming healthier and less danger-seeking, you can dramatically decrease the cost of your plan. A kale-obsessed woman in her mid-20s who lives in Colorado and bikes to work every day at a local organic supermarket might pay $20/month for a $100,000 policy, or $30/month toward a $500,000 policy for a 30-year term. A "middle-aged" average Joe who lives in Louisiana, loves his couch and potato chips equally, and spends his 9-to-5 time at a desk might pay $50/month toward a $100,000 policy, or $150/month toward a $500,000 policy for a 30-year term. Comparing policy rates on your own can be a pain. It's time-consuming, there's a lot to think about, and it can really get in the way of your Netflix binge. Your agent's got you covered, they'll know exactly what to look for when browsing coverage options, and they'll do all the super-messy stuff for you. For real, an agent can seriously simplify your life—at least through this process. They don't believe in being tied down (to one insurance company, that is), so they've got the freedom to shop, compare and assemble all the different pieces of the master coverage puzzle for you.